Organic vs Conventional: Have You Been Robbed? It’s Saturday afternoon and you’re checking out at your local co-op. You’re behind another member of your community, lining up your organic eggs, organic pork chops, organic milk, organic lamb shank, and organic cheese. You feel pretty content. You’re eating right, in a world full of chaos. Your body loves you. And probably best of all, your act of buying organic is part of a political movement; you’re supporting a population of small farmers, the precious few who have decided that animals are more than merely walking meat slabs, and that vegetables should be birthed from sunshine and good soil, not created in a lab. But organic may not mean the food is better for you. Organic may not mean the animal was treated right. Organic may, in fact, be little more than a sweet notion and marketing campaign that rests easy the hearts of the eco-conscious consumer. Organic, in other words, is not always the right choice. Sorry, but it’s true. In fact, if all of us knew exactly what “organic” means and the other available alternatives (fast corporate food never being one of them), it is possible we could actually save money and be better informed about the food we’re putting into our bodies. Joel Salatin, farmer and author of You Can Farm; Pastured Poultry Profits; and Everything I Want to Do Is Illegal—whom the New York Times refers to as the “high priest of the pasture” and is referred to at length in Michael Pollan’s Omnivore’s Dilemma—has a lot of good points when it comes to the question of organic vs. conventional. First and foremost: it’s not that simple. I’d like to take this moment and say: Hello. My name is Makenna, and I farm non-organic eggs. Don’t stop reading! At first I was ashamed; I’m someone who spent years being obsessive about only buying organic, no matter what. If I didn’t have an extra buck, I went without eggs that week. I’m serious. My money, in copious amounts, was channeled into the sustainability of small farmers all across the country, or so I thought. But recently, since moving to a Vermont farm, I’ve been confronted with the cold, hard reality of what organic really means. Not much. Sounds sweet. Feels nice. Connotes ideas of good. Suffice it to say, for all these years…I’ve been robbed. When I went to my local co-op and proposed I become one of their egg suppliers however, the grocery buyer asked me first off: “Are they organic?” “Well,” I told her, “they’re free-range! Almost to the point of too free!” But the buyer shook her head, and offered to pay me a dollar less per dozen. A hen with a good life doesn’t qualify as organic if the minimal grain they eat per day is not. Doesn’t matter if it’s one kernel of grain per day. “So,” I asked her, “if my birds were locked in cages but I stuffed them until they popped with organic grain, they’d be worth more?” She nodded. “Even though my hens have a better life, get sun and exercise, eat plants, roam free, and the eggs are lower in cholesterol and saturated fat as a result?” She nodded. Insane. Too often, especially in organic agriculture, we focus all the attention on the animal’s diet and miss the bigger picture… I am constantly amazed that people in Virginia pay exorbitant prices for certified organic broilers flown in refrigerated air freight from California, birds that do not receive green material and are raised basically in a conventional confinement factory house. From a world-view standpoint, it would probably be better for the environment to buy locally produced conventional chicken than to encourage the use of jet fuel and heavy metal to transport that chicken across the country. In the name of one cause, we sacrifice another equally worthy cause… the point is that organic feed is only a fraction of what is necessary to produce a truly dynamic bird. Certainly truly organic chickens are not necessarily bad. But neither are they necessarily good. So, what do you — the consumer — do now? Most important is to keep in mind that organic certification is a label, and not a guarantee your meat had a good life, or is healthier than “conventional” brands. This is not a plug for corporate food. Of course you’ll still want all natural, hormone and antibiotic free meat, but…Organic? It’s so much more expensive, and who has extra cash for false promises these days? It’s in times like these when it’s especially good to know what’s behind the label. Which, in the worst cases, is nothing more than a big, fat, unhappy lie. To read more of Joel Salatin, check out his books: You Can Farm, Pastured Poultry Profit$, Everything I Want To Do Is Illegal, Salad Bar Beef,, Family Friendly Farming, and Holy Cows and Hog Heaven. this is how trader joes and whole foods turned into megacorporations, and why i do not shop at those stores. a labels just a label…its much more important to buy locally produced food – organic or not. lane – okay, but I’m not going to go into Peoples and buy one tomato for $4 even if it is organic. And why can’t Peoples sell good bread for under $4. Peoples has gotten away from its original mission – to deliver quality and inexpensive food to the people. I’m sorry to bust your bubble, dude, but in general the coop in OB is too overly priced (as is Whole Foods no doubt). i agree with your statement about peoples’ mission – in essence, it is not a true coop anymore. but based on trial and error, my weekly grocery shopping only ends up costing approximately 5-8 dollars more a week at Peoples than by doing the shopping at one of the chains. of course, it is more expensive – and some people can’t afford that extra five dollars. but herein lies the choice: shop at an outlet that is simply a branch of a corporate entity or shop at a local, community oriented, non-profit. i am aware that there are some issues with the pricing strategies and questionable intentions of the co-op. if we want an entity like that to return to its roots, its up to us as the community (and that includes everyone in OB, even if theyre not “members”) to force that change by demanding more answers and getting to the various committee meetings where many of the important co-op decisions are discussed. I find it hard to believe that someone feels better giving their money to vons, tj’s, henrys or for that matter, barons (whose pricing strategies eerily mirror the tactics discussed in the above article ie huge price gap between commercial and organic) than peoples. its akin, but not quite as bad, as renting movies from blockbuster over paladin or galactic. yeah the selection may be better, and it may be a tiny bit cheaper (like 1 dollar for the whole rental)…but in the end, supporting it just leads to negative growth for the little guy. we are lucky to have such an outstanding farmers market and successful co-op in our community – even if that co-op is going through an identity crisis. let me clarify one thing: the coop mentioned in the article is NOT the OB Peoples Food Coop. The article is talking about coops in a more general sense. On the other hand… let’s check out what going on over there. Maybe it’s worth a story in the OB Rag. i was aware of the general coop referenced in the article; it actually goes to show that it is not just peoples that may be finding it difficult to stay completely in line with its original guidelines. there was recently an election for the coop board. maybe change is on the way? People’s in OB is vegetarian, this article was about – gasp! – organic meat mainly. I don’t eat meat, so it was fairly irrelevant to me. I wouldn’t diss Trader Joes all that quickly. They offer good, quality food much of it organic or at least without preservatives – and their prices are some of the best on the market – better than Whole Foods, Peoples, Vons etc. When I do come out of the water, I go straight to TJs. The people are very friendly, many of them have been there for years – that says a lot about a business, if you can see the same employees there year after year. For a comparison, the checkers at Peoples change with the season. What’s up with that? well, i guess the bubble has to burst at some point. as a non-meat eater, I look mostly at produce as the barometer. The processed stuff is generally the same, although since tj has its own brand you really have no idea how its being packaged, where its coming from, or who really makes it. at least with a brand name, you can look into it. for example muir glen and cascadian farms brands, which are stocked at peoples and many other stores, are now owned by general mills. this is a far cry from their original business principles. but I KNOW that, because I can look into it and research it myself. in contrast, tj brand stuff is produced all over the place…hard to track. maybe that masala simmer sauce was made in wisconsin, but their yellow mustard was made in germany. you never really know with them, and its hard to make educated food decisions when shopping there. Trader joes recently got a lower rating than target and wal mart for sustainable fish purchasing practices from greenpeace. something to remember when you buy that alaskan salmon or chilean sea bass conveniently packaged about a week ago 2,000 miles away. additionally, trader joes is owned by the same company that owns the Aldi chain of stores. They employ the same principles, and intend on using the same growth measurement when opening new stores in the future. Again, personal preference reigns supreme. Id rather support a local co op then a branch of a billionaire german family’s conglomerate. as far as produce goes, tj’s is on a much lower level of quality then pretty much every other supermarket around here – vons, barons, henrys etc. its sad to go into a market in california and see produce from another state. However, theres definitely something going on with the employees at peoples. whole foods and trader joes have very little turnover and excellent benefits. as a community store, it is definitely a concern that peoples has such high turnover. that observation is definitely not lost on those who go in there weekly or daily; something is going on. this debate could go on forever. when i first stepped into a trader joes, at 19 years old , i was blown away by the prices and atmosphere. now that im a little older and understand business principles a little bit better, ive made an educated decision to try and avoid their stores. again, personal preferences rule. It’s important to consider the percentage of income spent on food. Americans spend on average less than 10% of their household income on food, as compared to 30 years ago when we spent 15%. If you go back to the 1800s, the percentage was much higher. As income increases, percentage of income spent on food goes down. What does this mean? Simple. Goodman’s either/or argument is a false dichotomy. 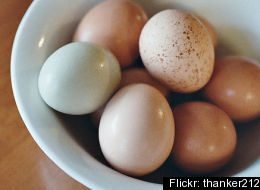 If she were willing to pay more to feed her chickens organic food–which does not preclude food scraps, as long as she eats organic food–and charges more for eggs, she could add organic to the list of her eggs’ attributes. Eggs that are truly free range, vegetarian fed and organic might cost the price of about a cup of coffee more per dozen than cheap eggs, but they will be well worth it. Lane is wise to point out the relatively minor additional cost for him to eat better. A lot of people who won’t pay four dollars for a loaf of good bread are more than willing to pay for giant screen TVs, iphones, Pilates, fancy rims for their truck, HBO, and so forth. In America, even poorer communities can afford to make eating healthier a priority. What is needed is sound nutrition information and de-corporatization of foods served in schools, along with a national reassessment of what’s most important. The point is not that organic is a panacea, but that certified organic methods of food production, when combined with an emphasis on cruelty-free and local food production, are the three-component direction we should move in. It won’t cost as much as people think, especially if they’re willing to give up a few of the buzzes and whistles of 21st century developed life for the sake of their health and the health of the environment. Thanks DA Kolodenko – we just posted that link as an article. When asking whether there is a difference between conventional and organic food and farming, one needs to look no further than the Gulf of Mexico, which now houses a massive, nightmarish “dead zone” (nothing is alive there) the size of Connecticut due to pesticide runoff from intensive farming of corn and soy beans.?? The USDA Organic Seal is the one assurance to all retail buyers and consumers that the farmers are raising food under the strictest production practice in the world, without the use of synthetic pesticides, antibiotics or synthetic hormones. Achieving and maintaining organic certification is no simple or inexpensive task. It requires years of tending the soil, land and animals, and reams of paperwork farmers must submit to validate their work. In fact, organic farming is the only type of farming in which the producers must maintain a five year paper trail of their purchases and processes. Organic Valley calculates our family farm owners have kept nearly 60 million pounds of synthetic nitrogen off the land over the past 20 years. Our dairy farmers received an average pay price 38 percent higher than conventional farmers for their milk. Organic food costs more, but what is the value of good health? Pesticide intensive agriculture causes cancer, infertility and dead zones. Industrial agriculture destroys communities and puts the production of food into the hands of a few whose bottom line goals dominate decisions. When it comes to value and values, organic is the clear winner! Allow for exercise, freedom of movement, reduction of stress appropriate to the species. Access to outdoors, shade, shelter, exercise areas, fresh air and direct sunlight suitable to the species, its stage of production, climate, and environment. Shelter allow for comfort behaviors and exercise. Too think that an animal becomes organic by being outside and free range misses the point. How does the consumer know that the chicken didn’t get exposed to used engine-oil (carcinogenic)? Or if there is a toxic dump accessible to the chicken? Who knows if the grass the “happy hen” is picking on is grown on a septic field full of toxic effluents? Potential contaminants are checked by the organic inspector. Another source of contamination is the feed. Non organic grains (natural) include substances that organic forbid. Like Glyphosate See: for what is likely to be used on wheat. Yes, there is more to consider than just the “organic” label. Buy ripe. Buy seasonal. Buy ethical. Buy Local. 100 years ago people always knew the farmer who grew their food. Yes, there is good and bad organic. Since corporations have entered the fray, 3-piece suits, motivated by profit, do everything they can to convince you to eat their organic brand while cutting corners. And Yes, the “USDA Organic” certification has been diluted from the CCOF, QAI and OTCO standards. So, vote with your pocketbook and force positive evolution of the industry. Some day everyone will buy organic! It is unavoidable! You see, when oil exceeds $100 a barrel, organic food costs less to produce than conventionally grown. The Organic Trade Association would like to offer an alternative perspective to your assessment of organic as “little more than a sweet notion and marketing campaign.” By law, organic products must comply with federal regulations for production and handling. These regulations state that organic agriculture is “based on minimal use of off-farm inputs and on management practices that restore, maintain and enhance ecological harmony.” The regulations also prohibit the use of toxic and persistent pesticides, antibiotics, synthetic hormones, and genetic engineering, among other things, and specifically outline what can – and cannot- be identified as organic. Organic regulations also take seriously the issue of animal welfare. USDA”s National Organic Program Final Rule was, in fact, the first USDA regulation to make mention of animal welfare. The Rule established standards around the content of livestock feed. Sections 238 and 239 of the Rule also outline livestock healthcare practice and living conditions standards, providing for “conditions which allow for exercise, freedom of movement and reduction of stress appropriate to the species,” among other things. Work on the issue of animal welfare continues today. The National Organic Standards Board”s Livestock Committee has made access to the outdoors for poultry a top priority on its work plan for Fall 2009. A rule around organic ruminants” access to pasture is also well underway. Organic regulations offer consumers assurance that the organic products they buy are produced and processed in a manner that maintains product integrity and supports animal well-being.